14 Gloucester is located on the west side of Gloucester, between Marlborough and Commonwealth, 12 Gloucester to the north 20 Gloucester to the south, across Alley 428. 14 Gloucester was designed by architect John H. Besarick and built in 1872 by carpenter and building contractor Hiram A. Gerrish, one of four contiguous houses (334 Marlborough and 10-12-14 Gloucester), built for speculative sale. Hiram Gerrish is shown as the owner on the original building permit application for all four houses, dated June 4, 1872. Hiram Gerrish purchased the land for 10-12-14 Gloucester and 334 Marlborough on June 26, 1872, from George Martin Gibson, also a builder and contractor. George M. Gibson had purchased the land on March 1, 1872, from a real estate investment trust formed by Grenville Temple Winthrop Braman, Henry Dwight Hyde, and Frank William Andrews. The land was part of one of four tracts of land the trust had purchased that same day from the Boston Water Power Company. Click here for an index to the deeds for 14 Gloucester. On September 7, 1872, when the houses were under construction, Hiram Gerrish sold all four to George M. Gibson’s son, George Alonzo Gibson. He was a builder and contractor in business with his father, and later would become a lawyer and, after that, a piano manufacturer. On January 25, 1873, when the houses were substantially complete, Hiram Gerrish acquired them back. When he subsequently sold the individual houses, Hiram Gerrish included in the deeds a three foot wide easement across the rear of 12-14 Gloucester to provide access to the alley for 10-12 Gloucester. The portion of the easement across the rear of 14 Gloucester was increased to three feet six inches in April of 1879, and the further modified in December of 1882 to run across the rear of 336 Marlborough and then to the alley. On February 5, 1874, 14 Gloucester was purchased from Hiram Gerrish by Edwin Toppan, a real estate agent. He lived in Brighton. He purchased 10 Gloucester on the same day. On November 1, 1874, 14 Gloucester was purchased from Edwin Toppan by John H. Buttrick, an apothecary and banker in Lowell. By 1875, it was the home of Edward Charles Pickering and his wife, Elizabeth (Lizzie) Wadsworth (Sparks) Pickering. They had married in March of 1874, and 14 Gloucester probably was their first home together. Edward Pickering was a professor of physics at MIT and later would become a noted astronomer. They continued to live at 14 Gloucester until 1877, when he became director of the Harvard College Observatory and they moved to Cambridge. On September 1, 1877, the Danvers Savings Bank foreclosed on a mortgage it held on 14 Gloucester and took possession of the property. By 1878, 14 Gloucester was the home of wholesale boot, shoe, and leather dealer Frank H. Skinner and his wife Helen Frances (Fay) Skinner. They had lived at 84 Mt. Pleasant in 1877. On April 16, 1879, 14 Gloucester was acquired from the Danvers Savings Bank by James Jackson, a stockbroker with the investment banking firm Lee, Higginson & Co. He and his wife, Rebecca Nelson (Borland) Jackson, lived at 302 Berkeley with his mother, Sarah Anne (Boott) Jackson, the widow of Frances Henry Jackson. The deed from the Danvers Savings Bank included language which increased the three foot wide easement across the rear of 14 Gloucester to three feet six inches in width. The Skinners continued to live at 14 Gloucester during the 1879-1880 winter season, after which they moved to a new house they had built at 372 Marlborough. 14 Gloucester was not listed in the 1881 Blue Book. On March 16, 1881, 14 Gloucester was purchased from James Jackson by attorney and real estate trustee Francis Clarke Welch. He and his wife, Edith (Thayer) Welch, made it their home. They had married in December of 1880. 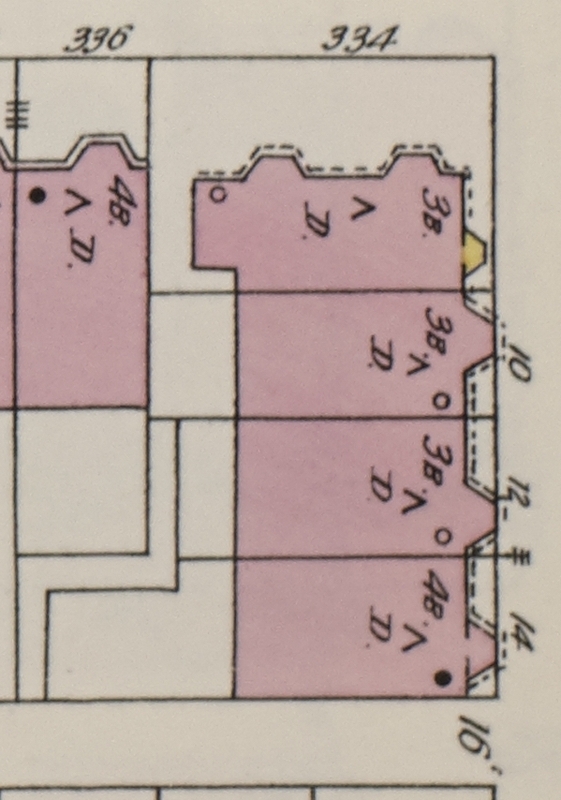 The original lot at 14 Gloucester had a frontage of 23 feet on Gloucester and 61 feet on the alley (the same depth as the lots at 334 Marlborough and 10-12 Gloucester). 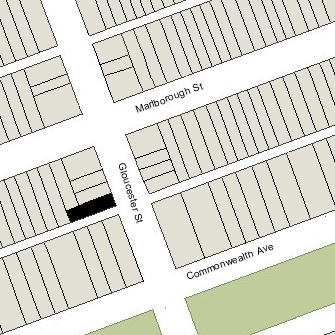 On December 6, 1882, Francis Welch purchased the rear 23.5 feet (north-south) of the lot at 336 Marlborough, allowing him to extend his lot at 14 Gloucester another 23 feet to the west. He purchased the land from James Barr Ames, whose father, Samuel Tarbell Ames, was about to construct a new house on the remainder of the lot. 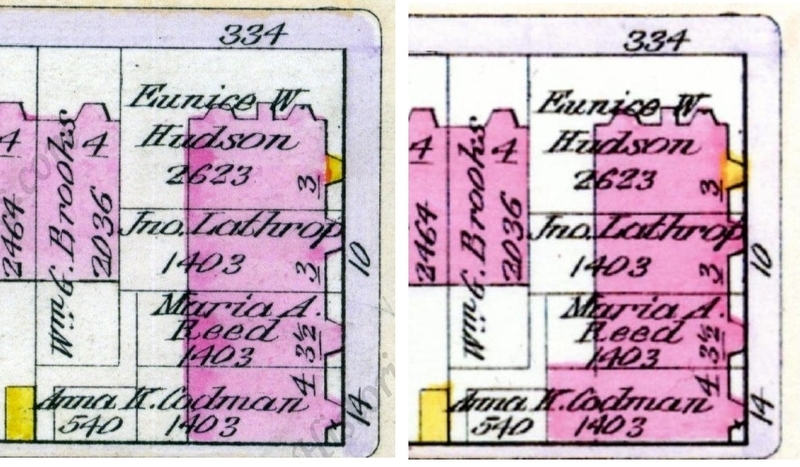 In conjunction with the purchase, the owners of 10-12-14 Gloucester, 334 Marlborough, and 336 Marlborough entered into an agreement limiting the depth of any house built at 336 Marlborough to 64 feet from Marlborough and specifying that the eastern wall of 336 Marlborough (facing the houses on Gloucester) could have no windows and was to be built entirely on the lot for 336 Marlborough (not straddling the boundary line as was customary for party walls). The agreement also provided that no building higher than 6 feet could be built on the lot behind 336 Marlborough that had been purchased by Francis Welch. The agreement also reconfigured the easement to provide access to the alley for 10-12 Gloucester. It eliminated the 3.5 foot easement at the rear of 14 Gloucester and, in its place, created a 3.5 foot easement at the northern and western boundaries of the lot at the rear of 336 Marlborough. This modified easement provided access to the alley for 10-12 Gloucester and also for 336 Marlborough. The Welches continued to live at 14 Gloucester during the 1893-1894 winter season, but moved thereafter to Deerfield Street. Sometime between 1887 and 1897, 14 Gloucester was remodeled to eliminate the original mansard and build and additional floor, making the house four stories above the basement. On March 19, 1894, 14 Gloucester was acquired from Francis Welch by Anna K. (Crafts) Codman, the wife of real estate investor Russell Sturgis Codman. They previously had lived at 429 Marlborough. They continued to live there in 1907, but by 1908 had moved to 59 Marlborough, which had been the home of Anna Crafts’s parents, James Mason Crafts and Clémence (Haggerty) Crafts. Anna Crafts continued to own 14 Gloucester and lease it to others. 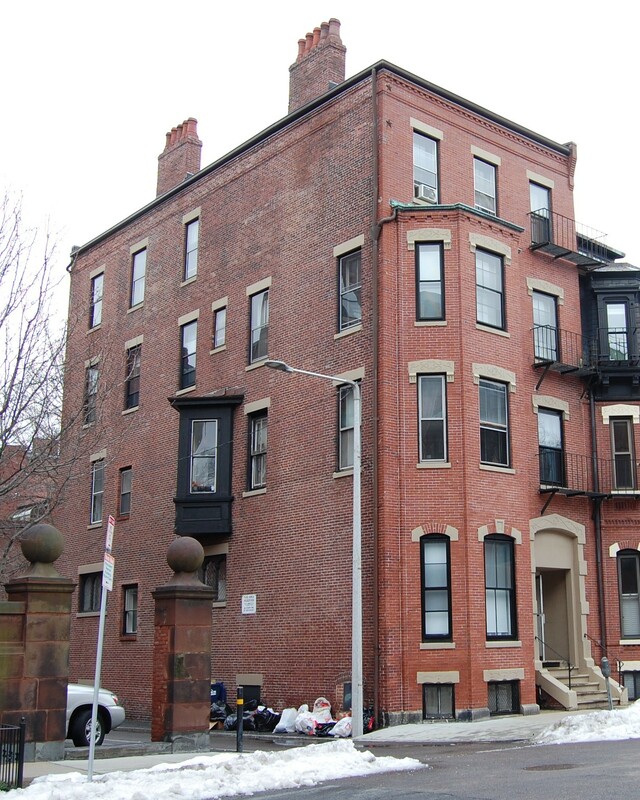 Sometime between 1902 and 1908, the Codmans expanded the rear of 14 Gloucester with a four story addition extending into the area that previously was the original rear yard. Francis Welch probably contemplated this extension of the house when he acquired the rear yard of 336 Marlborough in 1882; however, it was not built until much later (it does not appear on the 1902 Bromley map, nor on earlier Bromley and Sanborn maps, but does appear on the 1908 Bromley map). During the 1907-1908 winter season, 14 Gloucester was the home of Philip H. Stockton and his wife, Margaret (Head) Stockton. They previously had lived at 7 Hereford. They also maintained a home in Manchester, Massachusetts, which they had made their primary residence by 1909. During the 1908-1909 winter season, 14 Gloucester was the home of Eleanor Amelia Marguerite Cecilia (Shattuck) Whitney, the widow of Hugh Whitney. She previously had lived at The Graffam at 330 Dartmouth. She continued to live at 14 Gloucester until her marriage in November of 1909 to Dr. Elisha Flagg, a physician. After their marriage, they lived at 164 Marlborough. By the 1909-1910 winter season, 14 Gloucester was the home of Herbert Warren Mason and his wife, Persis Emery (Furbish) Mason. They previously had lived at 347 Commonwealth. They also maintained a home in Ipswich. Herbert Mason was a paper manufacturer in the firm of S. D. Warren & Co., founded by his paternal grandmother’s brother, Samuel Dennis Warren. 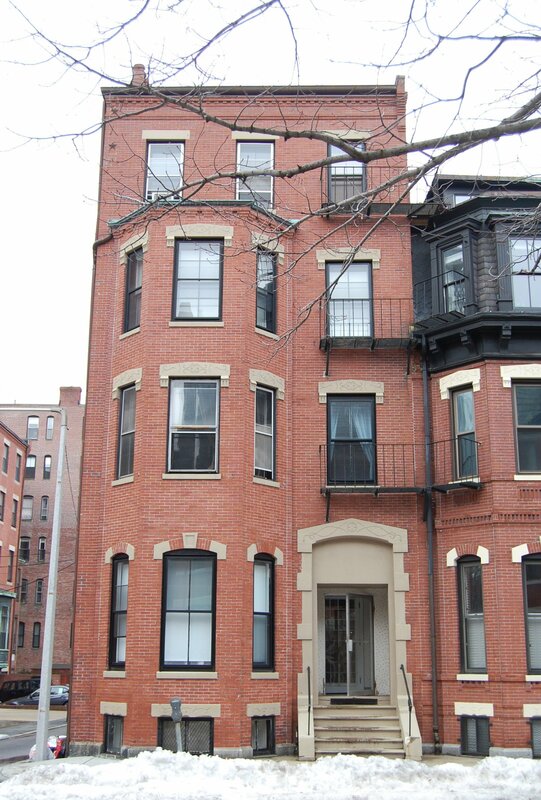 The Masons initially leased 14 Gloucester from the Codmans, but purchased the property on June 14, 1912. They continued to live there during the 1920-1921 season, but moved thereafter to 205 Commonwealth. On September 26, 1921, 14 Gloucester was acquired from Herbert Mason by Blanche (Valentine) Haskell, the wife of George Dotson Haskell. They previously had lived at 364 Marlborough. They also maintained a home in Marblehead. George Haskell had been a glove manufacturer in 1920. By 1925, he was president of the Bausch Machine Tool Company in Springfield. They continued to live at 14 Gloucester during the 1922-923 season, but moved thereafter. On April 16, 1923, 14 Gloucester was purchased from Blanche Haskell by Mary Bispham (Townsend) Jaques, the wife of Herbert Jaques, Jr. They previously had lived in an apartment at 491 Beacon. They also maintained a home in Manchester. In the 1920s, Herbert Jaques was an officer of the Hub Hosiery Mills, manufacturers of infants’ hosiery. 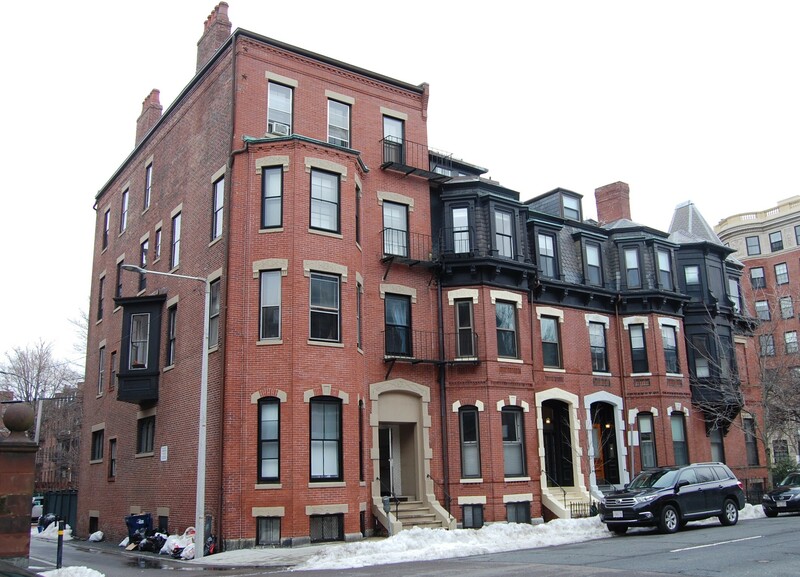 They continued to live at 14 Gloucester until about 1940, when they moved to an apartment at 192 Commonwealth. On November 16, 1940, 14 Gloucester was purchased from Mary Jacques by real estate dealers Warren-Stevens, Inc. In April of 1941, H. Leon Sharmat, treasurer of Warren-Stevens, applied for a lodging house license and was advised by the Building Department of the need to change the legal occupancy of the property and provide adequate egress and fire safety improvements. In September of 1942, Warren-Stevens applied for (and subsequently received) permission to install a fire escape on the rear of the building and convert the property from a single-family dwelling into a lodging house. From 1941, 14 Gloucester had been the home of Philip French and his wife, Gladys (Lawson) Stanwood French, who operated it as a lodging house. They previously had lived at 128 Bay State Road. Philip French was a former real estate and insurance broker who faced financial reverses in 1938, after which he and his wife began accepting lodgers at their Bay State Road home. He died in February of 1943. Gladys French continued to live at 14 Gloucester in 1946. On January 2, 1947, 14 Gloucester was acquired from Warren-Stevens Inc. by Vincent R. Brogna and Arthur Brogna. The Brognas were brothers and both were attorneys. The Brognas terminated Gladys French’s lease effective February of 1947, and filed for (and subsequently received) permission to convert the property into a two-family dwelling. Gladys French moved to 31 Fairfield. Vincent Brogna and his wife, Louise Marie (Egan) lived in one of the apartments at 14 Gloucester, and Arthur Brogna and his wife, Margaret (Burbank) Brogna, lived in the other. On September 16, 1949, Vincent Brogna acquired Arthur Brogna’s one-half interest in the property. Arthur and Margaret Brogna subsequently moved to an apartment at 495-497 Beacon. Vincent and Louise Brogna continued to live at 14 Gloucester until about 1962, with various other residents occupying the other apartment. On June 18, 1963, 14 Gloucester was acquired from Vincent Brogna by Morris Haskell Kalman of Kalman Realty, located at 253 Newbury. In June of 1963, Kalman Realty applied for (and subsequently received) permission to convert the property from a two-family dwelling into nine apartments. Morris Kalman died in October of 1966. On July 1, 1967, 14 Gloucester was acquired from Morris Kalman’s estate by Serena F. (Rosen) Weinstein, the wife of Dr. Frederic Weinstein, a dentist. They lived in Chestnut Hill. On November 2, 1983, she transferred the property to herself as trustee of the River Street Realty Number Two Revocable Trust. Frederic Weinstein died in May of 2010 and Serena Weinstein died in July of 2012. On February 12, 2015, 14 Gloucester was acquired from the Weinsteins’ daughter, Joanna (Weinstein) Chodes, widow of Stephen Chodes, as trustee of the River Street Realty Trust II, by James E. Keliher, trustee, of the 14 Gloucester Street Investment Realty Trust. The property changed hands. It remained an apartment house in 2017.